This bottle is going to look very chic on our nightstands. 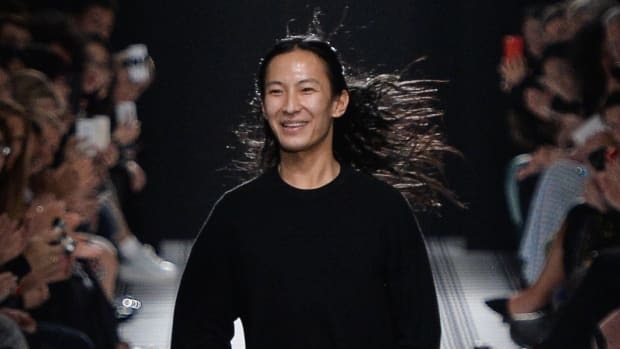 Editors were in for a surprise when they stopped by the Balenciaga resort 2015 presentation this week in New York: Alexander Wang unveiled his very first fragrance for the French house, which is due out in October. WWD is reporting that the new scent, called B Balenciaga, has been in the works since Wang became creative director in December of 2012, and the "woody" fragrance will have notes of lily of the valley, violet green leaves accord, cedarwood and more. The bottle is modern and architectural, with cracked, frosted glass that&apos;s inspired by the marble floors in Balenciaga’s original salon in Paris. When it came to the ad campaign, which will debut in the October issues of fashion and beauty magazines, Wang turned to the same duo that made the spring 2014 campaign for his eponymous label so compelling: Model Anna Ewers — who&apos;s wearing a veil and not much else — and photographer Steven Klein. The B Balenciaga fragrance, which is licensed by Coty Prestige, will be sold in over 300 U.S. specialty stores — Sephora, Nordstrom and Neiman Marcus among them — beginning in mid-October.